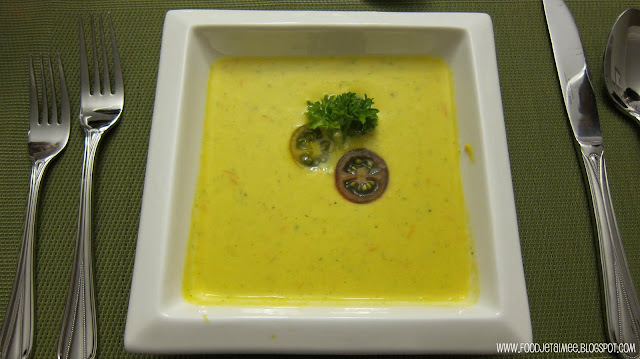 The first recipe from Dinner Club I want to share with you is this beautiful, colourful, and savoury chilled soup. I had my doubts about this one, I'll admit, because if I could pick a single vegetable I like the least, it's celery. I was immediately put off of this soup because of its addition, but later coaxed into trying it once I realized it was just the leaves that were needed. Passing the seeds of 5 pounds of tomoatoes through a sieve was definitely a labour of love, but completely worth it in the end! Because this soup never gets to feel the heat of a pot, the flavours of the herbs were so fragrant and fresh. I would absolutely recommend trying this recipe out before the fall, and if you want to try something that's still savoury but different from the classic gazpacho. 1. Set a coarse sieve over a bowl. 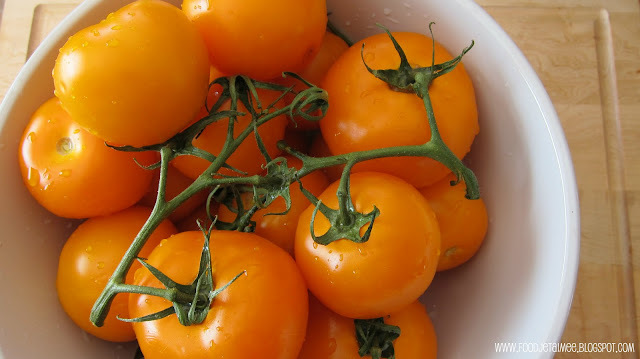 Halve the tomatoes crosswise and squeeze the seeds and juice into the bowl and discard the seeds. 2. 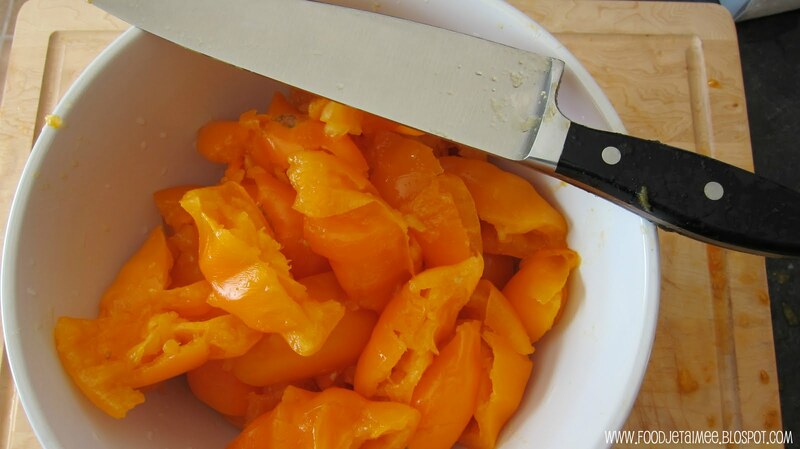 Coarsely chop the tomatoes and transfer to a blender. Add the strained tomato liquid, the scallions, the 1/2 cup each of parsley and celery leaves, the tarragon, lime juice, honey, yogurt and cold water and puree (in batches, if necessary). With the machine on, gradually pour in the olive oil and blend until incorporated. Season the soup with salt and white pepper and refrigerate until chilled. Ladle into small bowls. Garnish with cherry tomatoes and parsley and celery leaves and serve. Total Time: 40 minutes plus chilling. Serves 10. 1. I had a small sieve, so I really had to work at getting the liquid out. Much of the liquid sat on top of the piles of seeds underneath, so I spent a solid 10-15 minutes spreading and pushing the seeds and tomato guts around so as to not waste that gorgeous tomato juice. 2. Apparently, there is a widespread shortage (not sure how far widespread) of goat-milk yogurt. The goats have been under-producing this year, so farmers have been concentrating on getting goats' milk on the shelves, but not necessarily the yogurt. At least, that's what the people at both Superstore and Pete's Frootique have told me. As a substitute, I used the the Original, Balkan-style, full-fat yogurt made by Astro and it worked great. I did add a little extra (maybe 1/2 cup?) at the end because I wanted a thicker consistency. 3. I added a little more tarragon and a little less celery leaf. Just because. 4. This makes a lot of soup, so even in two batches, my blender was dangerously full to the brim. I split the chopped tomatoes and juice evenly between the blender and another bowl, then split the rest of ingredients as evenly as possible between the two batches. I didn't worry too much about the evenness, however, because it was all going to be mixed together eventually anyway. 5. I used multi-coloured cherry tomatoes and coarse black pepper for garnish, because they're just prettier. My massacred tomatoes: cored, halved, squeezed, seedless. Messy plating, but still love that colour! Do you think this would work as a hot soup, too? Rather than blending the tomatoes, maybe I could reduce them in a pan and then add the fresh ingredients towards the end? Any suggestions? Oh - YUM. Since Nova Scotia practically bypassed summer this year, can it now be winter so I can take you up on these suggestions?! Love the way your mind works, Cooke. Grilled Cheese. The food of the gods. Oh, I think there's hope yet. I used to be a celery hater, and while Cream of Celery Soup sounds like a nightmare to me, I've really gotten to love the green stringy stuff. Try this program....Step 1: Stuff celery stalk with peanut butter Step 2: Put raisins on top Step 3: Eat! Beautiful pictures, Aimee! Who grew the tomatoes? Glad you like the photos! I was a few weeks too early for tomato season at the market, so I got these orange tomatoes at Pete's Frootique in Bedford. They were the only ones carrying them!